The European annual limit value for protection of human health is 40 μg/m³, which applies on the whole of Belgium since 2015. The figure below uses box plots to show the evolution of the minimum, the 25th percentile (P25) , the 50th percentile (P50), the 75th percentile (P75) and the maximum annual mean NO2 concentrations in Belgium. The spatial average is represented by the blue circles. Box plots of the annual mean NO2 concentrations (μg/m³) for the period 1990-2016. The spatial average is represented by the blue circles. All data were calculated using the RIO interpolation technique. The highest NO2 annual mean of all Belgian grid cells is 37.3 µg/m³. 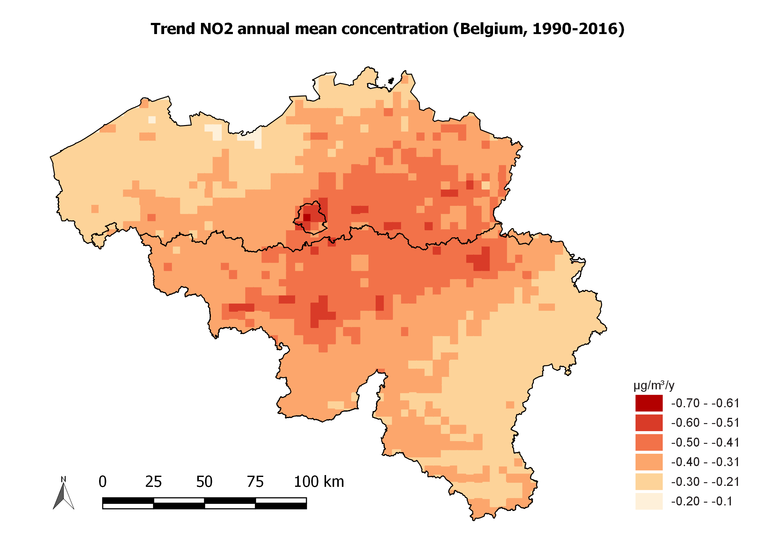 The average annual mean concentrations across Flanders, Brussels and Wallonia are 14.8 µg/m³, 28.7 µg/m³ and 10.5 µg/m³ respectively. The average across Belgium, taking account of the number of inhabitants per grid cell (population-weighted average) is 19.6 µg/m³. This value clearly exceeds the non-population-weighted average across Belgium (12.5 µg/m³), which indicates that the grid cells with the highest population numbers are also those with higher NO2 annual mean concentrations, namely the urban areas. Evolution of the NO2 annual mean in Belgium based on the RIO interpolation technique. 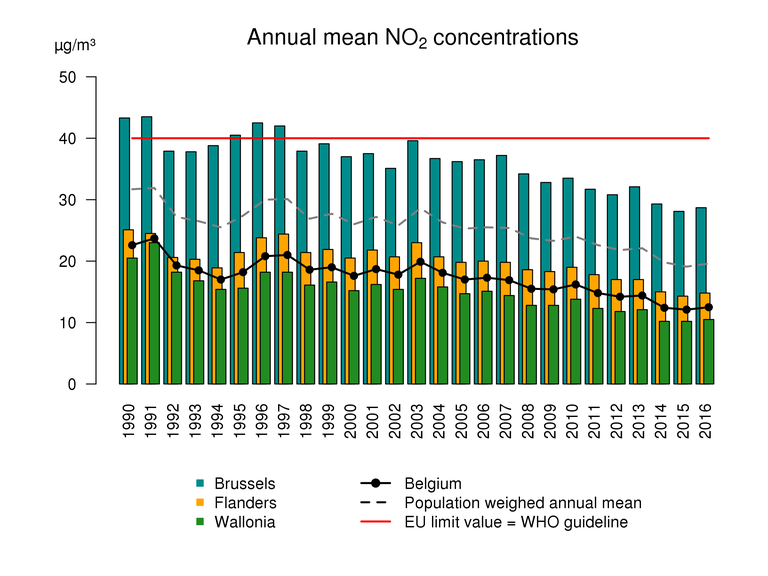 The decrease in the annual mean NO2 concentrations in Belgium over the period 1990-2016 is rather limited. The largest decreases - between -0.5 and -0.7 μg/m³/year - occur in the region roughly between Charleroi, Brussels and Liège. 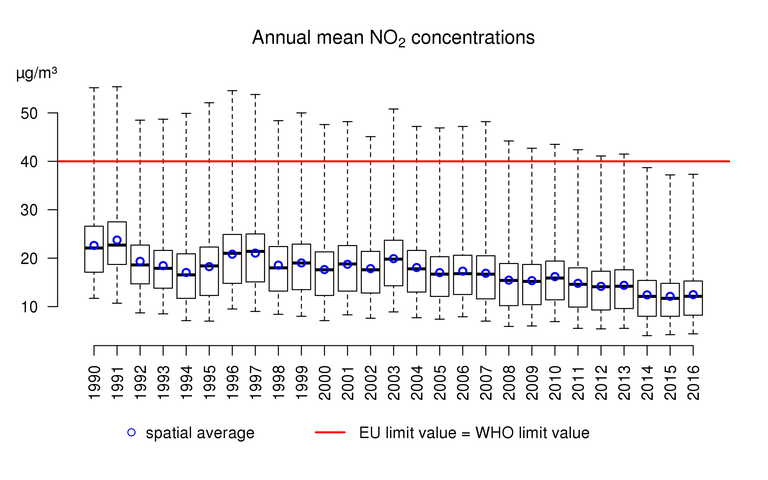 Trend (μg/m³/year) of the annual mean NO2 concentrations in the period 1990-2016. All data were calculated using the RIO interpolation technique.